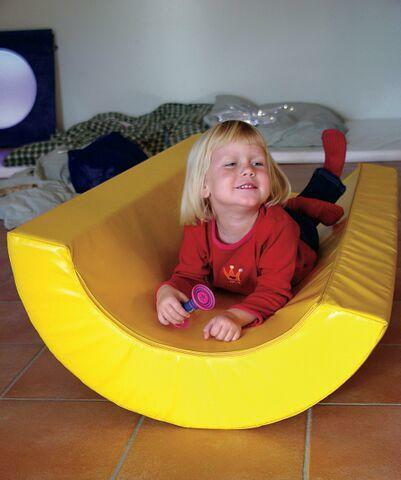 Padded yellow smile that invites the user to lie down and then allows gentle rocking, which is great for vestibular stimulation. Turn it over and stretch out on top of the Body Rocker. Wipe-clean durable vinyl. Made in USA. Truck Shipment. Loading dock or Liftgate/Inside Delivery necessary to receive shipment. Please contact customer service at 800-467-6222 for a quote. Dimensions: L: 58" x W: 27.5" x H: 12"